Home / Books / What is Culinary Medicine and What Does It Do? 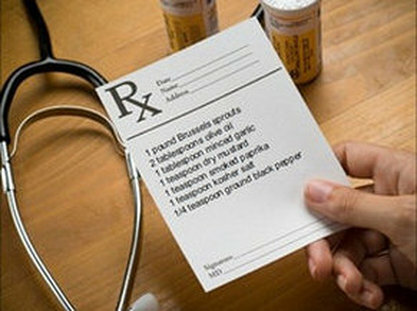 Culinary medicine seems to be having a moment in health care, or at least, it’s getting close. It’s been taught as cooking and nutrition electives in medical school since at least early 2003, at SUNY-Upstate, but now, according to reporting at WBEZ-Chicago 30 medical schools are offering some form of it, and there’s at least one endowed named center, at Tulane. David Eisenberg’s amazing Harvard-CIA clinician conference has been re-cast as culinary medicine; MedPageToday (a division of EveryDay Health) has begun a Culinary Rx Video Series; dietitians are seeking extra training and referrals for the same. Several cooking schools are also edging into a culinary nutrition curriculum, in Denver, Berkeley and Sonoma, Seattle, and even completely online to be part of tomorrow’s food movements today. Improving hospital food is on the menu, even nationally, as is food insecurity as a primary driver of chronic disease, and a medical problem in its own right. It’s clear that the right foods improve hospital outcomes, which is especially important when Medicare penalizes health systems for re-admission within 30 days for now 7 diagnoses. Yet this low hanging fruit remains on the tree. Medicine is always slow to change, but here is the first peer-reviewed paper on the subject: what is culinary medicine and what does it do? I know of two others in the works and am happy that my ChefMD’s Big Book of Culinary Medicine continues to be a popular text and recipe book. All of this is amazing, and every single one of these efforts and so many others need to be encouraged and nurtured: this is a time of 1000 flowers blooming, and stews stewing, because the role of food in both the prevention and treatment of disease is central to both personal well-being and to our economy and future as a people. The zeitgeist seems to be that young health and culinary professionals are more and more interested in not just less food processing and more whole plant/animal using, but better quality food for personal well-being. The health-conscious public is starting to share the same views, to be curious about GMO effects, to engage weight loss campaigns at work, to not just watch television competitions for health, culinary bravado and skill, but also to create their own, and to grow more of their own food when circumstances permit, bartering with neighbors when there is a bounty. Everyone seems to know someone who has severe food allergies but then got better. Or feels better off wheat. Or with more protein. Or with enough healthy fat. Or vacationing from fast food. Or replacing diet soda, energy drinks and their additives with filtered water or tea or citrus water. Culinary medicine knows those people are right. Eaters ahead of the crowd (generally on either coast) have been trying to eat cleaner, less processed, use their doctor as a coach/consultant/expert, and integrate a food as medicine approach in their own lives–without losing the joy in eating and well-being–for decades. But even in the heartland, where it’s not dinner unless there’s a hunk of something in the middle of the plate, there are more people shifting towards eating more vegetables and fewer refined grains. More nuts and seeds and less red and processed meat. More fruit, water and tea and less candy, cake and soda every day. Not surprisingly, this is exactly the major diet change needed to improve the state of U.S. health, disability and longevity. One area that is next and yet to be explored–and there are many that are next–is the utility and beauty of gardening and farming in a culinary medical context: a farm to rx approach. Few hospitals, medical centers or health care institutions have a demonstration garden in which patients, visitors and staff can be revived by the beauty of nature and engage with it; can learn from plants as they grow, protect themselves and interact with others, and make the journey from farm to plate and sometimes to pharmacy; and to see where some of their best medicine–from soups and stews to digitalis and taxol–really come from, and how those plants develop the nutrients they need, which we then share. A culinary medicine garden is an exciting new possibility, informed by therapeutic horticulture and beautiful medicinal herb gardens, but extending beyond those, to a place of personal medical education, clinical therapy, deep healing, well-being and play. Culinary medicine and population health have a bright future, and I can’t wait to see the creative paths people will take to create it.